Original map drawn up between Manuel Vaca, William McDaniel and L.B. Mizner for the land deal that created the town of Vacaville. This map shows traces of a land swindle that had Vaca selling off more land to McDaniel and Mizner than he thought he was selling. When Vaca realized he had been tricked, he filed suit. Vaca thought he was only selling one square mile to the two men, but ended up selling nine square miles. Vaca sued and lost the first round in court, but won the second.. 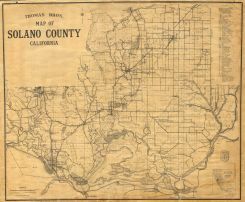 Historical map of Solano County, California. Compiled and published by Thomas Bros in the 1940s. 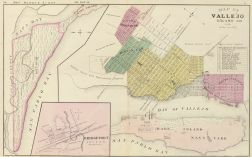 This highly detailed map indicates townships, school districts, highways, railroads, ranchos, bodies of water, neighboring counties, and topographic highlights..
Residence of T.T. Hooper, Birds Landing, Residence of William Donell, Birds Landing, Montezuma, Solano Co., CA. L.A. Pratt's stock farm, Birds Landing, Samuel Stewart's stock ranch, Denverton, Solano Co., CA. Infirmary at Fairfield, Residence of W.J. Pleasants, Pleasants Valley, Residence of Frank Williams, Vacaville, Solano County, CA. Nurse's Landing, Denverton, Res. and ranch of W.H. Turner, Suisun CA. St. Augustine's College, St. Mary of the Pacific, Benicia, CA.